Happy new year! It’s been quite a year in many ways, not the least of which was considerable progress on the mission of the OSET Institute and our TrustTheVote Project. We write on this last day to give you a first look at our 2018 Annual Review. We hope you find this summary of key accomplishments and developments for 2018 both informative and insightful. Most of all we thank you, our readers, for your continued support of the Institute. Finally, if you haven’t already, we hope you will make at least a modest donation to the cause of the OSET Institute as we conclude 2018 and start 2019. 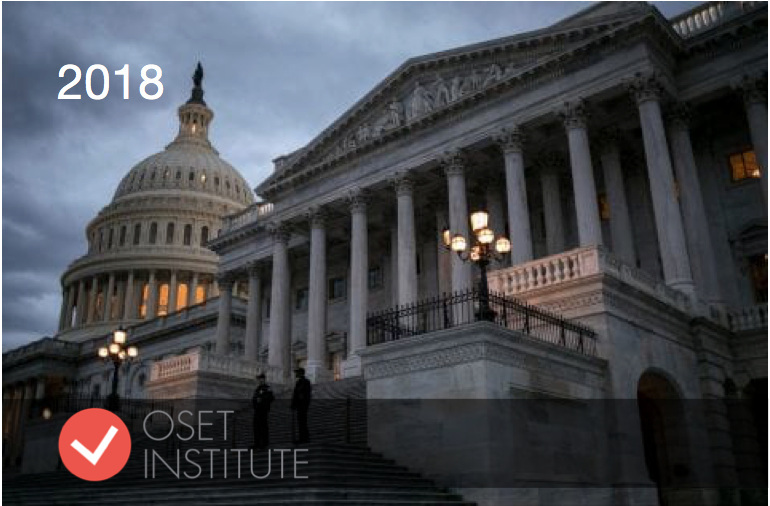 The OSET Institute remains the only non-profit non-partisan organization specifically focused on making higher integrity, lower cost, and easier to use public election technology. Watch for important initiatives in 2019—efforts to improve the integrity of voter rolls; services to ensure voter’s know the status of their registration; innovations in election results reporting; and continued efforts in developing new public technology for casting and counting ballots.